Turkeys Can't Fly - Fact or Myth? The reason wild turkeys can fly while domestic turkeys can’t is because domestic turkeys (for example the common Broad Breasted White turkey) are heavier and less muscular than wild turkeys due to being bread for their breast meat. The turkey uses its breast muscles to fly, thus the lack of muscle and the extra weight on the domestic turkey means it can’t fly in practice due to breeding. FACT: Domestic turkeys can weigh twice what a wild turkey does. Wild turkeys range from about 5 – 20 pounds, Domestic Broad Breasted White turkeys can weigh up to 40 pounds. FACT-ish: According to the internet wild turkeys can run up to 25mph, fly up to 55mph, but typically only fly in short bursts of 1/2 mile or less. The simplest way to prove turkeys can fly is with video evidence. Here is a video of a turkey flying so you can see it with your own eyes. That covered, I can confirm that turkeys can fly. I live around turkeys and I have seen them fly up to trees to get away from predators (actually the local dog, who probably wasn’t actually going to eat the turkey). The reason people tend to think turkeys can’t fly is because they spend most of their time on the ground, and unlike other birds, they don’t sustain flight (I’ve only ever seen them fly up to a tree in video and in person). All that said, the bottom line here is that turkeys can fly, and they can fly way faster and farther than you would expect…. assuming you didn’t expect them to fly at all. Get more Turkey facts from TheSpruce.com. FACT: There is a class of flightless birds, although this class doesn’t include the turkey, it does include ratites (ostrich, emu, cassowary, rhea and kiwi) and penguins. See a list of flightless birds. There is a common belief that turkeys can’t fly. This is not correct. 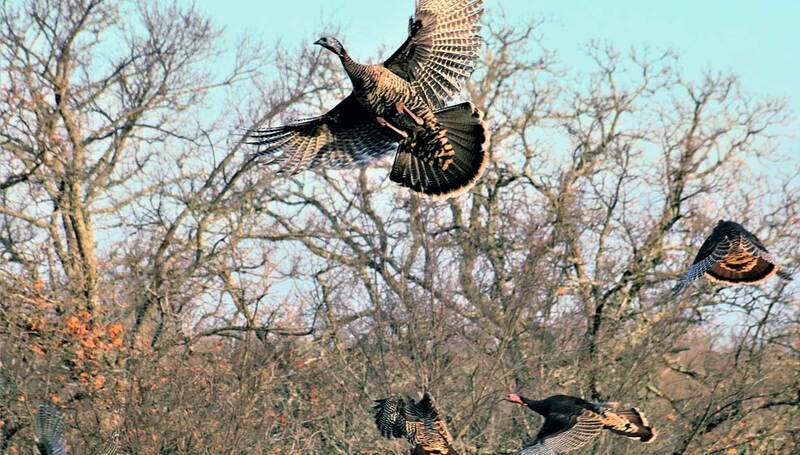 Turkeys can indeed fly, and wild turkeys typically fly at least once a day to roost in trees over night. Fun Facts About Wild Turkeys. TheSpruce.com.